When your organisation receives a contribution from a contact, you can add it to their record. This will be done automatically if the payment is made through CiviCRM (for example, a membership or event fee made with an online registration) but offline payments (cash, cheques etc) will need to be manually recorded to ensure that reports generated from CiviCRM are accurate. If the donor does not already exist in the database, you need to first create a new contact record for them; see Contacts for information on how to do this. Once the record is created, you can then enter the contribution. Find the contact's record using one of the contact search tools, for example Search > Find Contacts. Select the contact's Contributions tab. Click Record Contribution (Check, Cash, EFT...). Alternatively, if you have set up a payment processor that allows credit card transactions directly on your site, you may select the Submit Credit Card Contribution option and process the payment immediately. Complete the new contribution form. The following screenshot shows the offline contribution (i.e. contributions via check, cash, EFT, etc.) form. If you selected to record a credit card contribution, the credit card form is almost identical except for the payment-related fields. Record the Financial Type, amount, received date (the default is the current day), receipt date (shown on the receipt generated by the system), and status (the default is Completed). Any custom fields for contributions will also appear on this form. 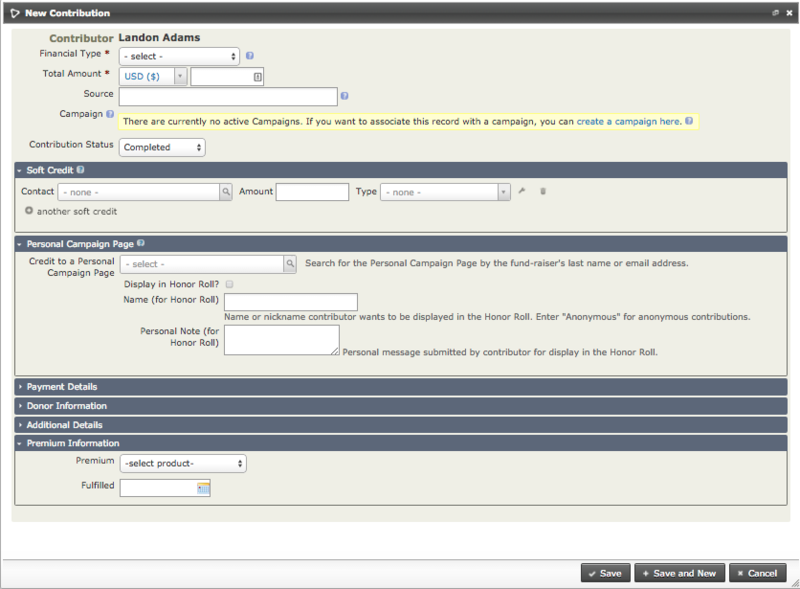 The Soft Credit To field works with personal campaign pages (PCPs) that harness your contacts' help for campaigns. When you enter a donation manually on the contribution form for the contributor, you can assign a soft credit to the owner of the PCP. There is more information about PCPs and campaign fundraising pages in the Set-up chapter of the CiviContribute section. The Additional Details section near the bottom of the screen offers other options including adding a note about the contribution and entering the date when a thank-you letter was sent. The last two sections allow you to enter whether the contribution was in honor of someone else (Honoree Information) and whether there is a premium associated with the contribution (Premium Information). Click Save, or Save and New if you are entering further contributions. If you find that you are entering more than a few contributions at the same time, consider using the Batch Data Entry method. The Batch Data Entry feature allows you to enter off-line contribution, membership or pledge payments you have received using a batch entry grid input screen where you can use the ‘autocopy’ icons at the top of each column to quickly fill in field values. It eases data entry when you have a lot of payments to record at one time. It also lets you verify the total amount and count of items in the batch against the payments recorded on your deposit slip(s). Each batch contains either contribution payments or membership payments or pledge payments. During the batch data entry you can create new contacts on the fly. You can save the batch and return later to continue entering payments. If you have the appropriate permissions, you can also edit the total amount and count of items in the definition of the batch if needed. Create a new batch for data entry. Enter Contribution, Membership or Pledge Payments (check, cash, EFT, etc.). Validate and Process the Batch Totals or Save the Batch. The details for each step are listed below. From the menu, click on Contributions > Batch Data Entry or Membership > Batch Data Entry. You can edit or delete Batch information later on by going back to the Bulk Data Entry screen, then clicking on Edit or Delete next to the batch you want. Once you enter information about the batch, you can begin entering payments on each line. Paid by: enter the type of payment vehicle, e.g. cash, check, EFT, etc. Type: For a new membership you will select the organisation and type of membership. For the renewal you can change the membership type. Member Since: When you open the batch entry form, this is populated with the current date If you choose to renew a membership it will change to display the start date for that membership. It can be edited as needed. Start Date(reserved): This is blank. You only need to fill in this field if you want the start date to be other than the default. End Date(reserved): If this is left empty, CiviCRM will use the membership rules to set it to the correct date. Check Number: Enter if paid by check. From the menu, click Reports > Create Reports from Templates, then click Contribution Report Detail, enter your report criteria and under Set Filters area, next to Batch Name, select “is one of” or “is not one of” and select the name(s) of the batch(es) you want. Go to the menu and click Administer > Customize Data and Screens > Profiles, then click on Reserved Profiles tab. Click on Fields next to called New Individual, New Household, or New Organization. You can then add, edit or rearrange the fields as you want to see them in the batch entry input grid. See Profiles to learn more about profiles, generally. Reserved profiles for New Individual, New Organization, and New Household, are used in other areas of CiviCRM. Be aware that if you alter these profiles for use with Batches, these same changes you’ve made will also appear on other screens where you have the option to create a new contact inline. 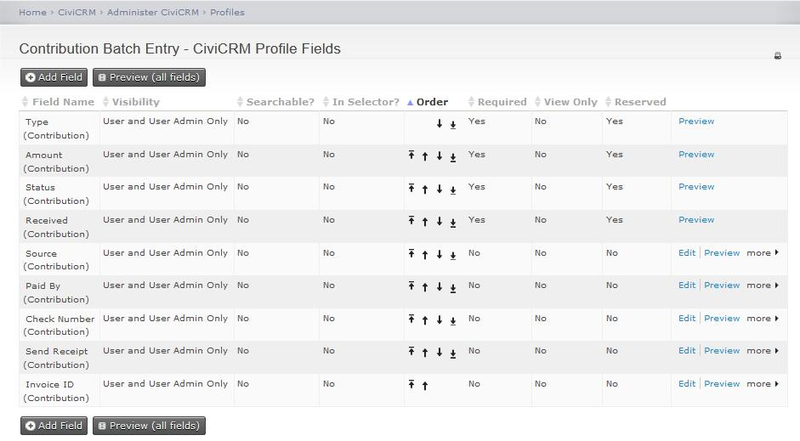 The screenshot above is CiviCRM’s default configuration of the New Individual profile, which is used when you select to create a new contact for an individual during batch entry of contributions or membership payments. Go to the menu and click Administer > Customize Data and Screens > Profiles, then click on Reserved Profiles tab. Click on Fields next to Contribution Batch Entry profile or the Membership Batch Entry profile. You can then add, edit , or rearrange the fields in this profile, e.g. you may have other custom contribution fields you would like to display and collect information, and display in the batch entry input grid. To find out more read Profiles. Above is CiviCRM’s default configuration for the Contribution Batch Entry profile, which is used when you record information about a contact’s contribution or pledge payment. 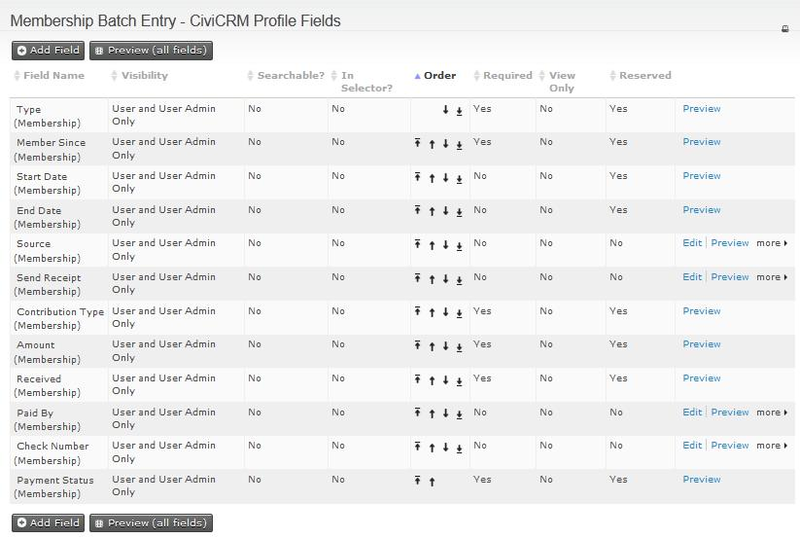 Above is CiviCRM’s default configuration for the Membership Batch Entry profile, which is used when you record information about a contact’s membership payment. If you have not imported data before, please read Importing data into civicrm.